i am so excited for thanksgiving this year! i’ve been putting a little bit more effort into it this year in terms of making it more kid-centric. we’ve already made some super cute pinecone turkey crafts using either felt, silk feathers, or paint to use for both decoration and as place card holders, and i couldn’t be more happy with how well they each turned out! we’ve also made a plan to make turkeys out of cinnamon rolls + bacon on thanksgiving morning, and we have even made pilgrim hat and dress crayon/colored pencil holders out of paper cups as well. 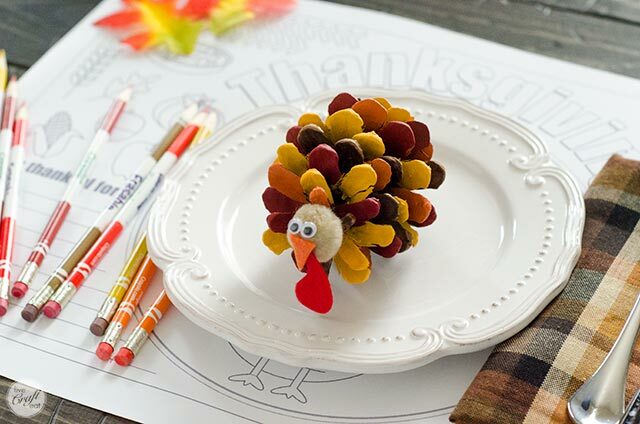 they will be perfect with our printable thanksgiving activities for kids that i made a couple years ago. but i wanted to make something else that they could color at the table…like at a restaurant, ya know? while you are patiently waiting for your dinner? 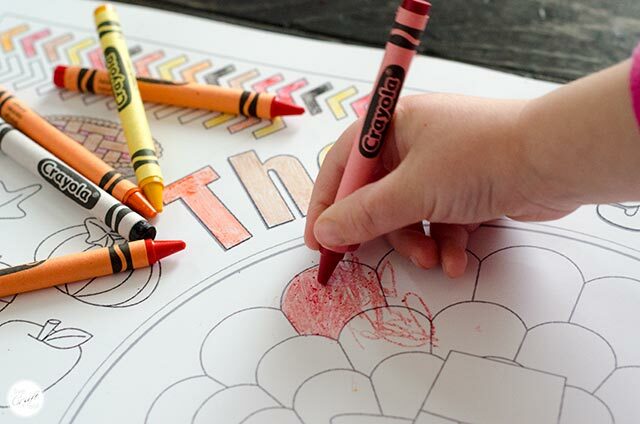 i wanted something that incorporated some coloring…some activities…so both the littles and the big kids would have something to do, and for all of it to be on one page. so i decided to make thanksgiving placemats for my kids that they can use in addition to those printable activities that we’ve done in the past. i actually made 2 different sizes. 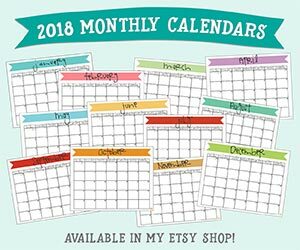 one is 12″x18″ – this size is more like an actual placemat – there’s a space to put a 9″-10″ plate, and still lots of things to do and look at around the edges. so while this one is ideal, in my mind, it is likely that most people will not be able to print it on a normal home printer just because of the size. i called around to a few places in my area and found that i could get it printed at fedex/kinkos on plain white paper for about $0.75 per square foot. so the cost would be somewhere around $1.50 per placemat, which i think is great considering how long it will keep my kids occupied while i try to make dinner happen! coloring :: there are harvest/thanksgiving pictures, including the big turkey in the center (where their plate will eventually go). 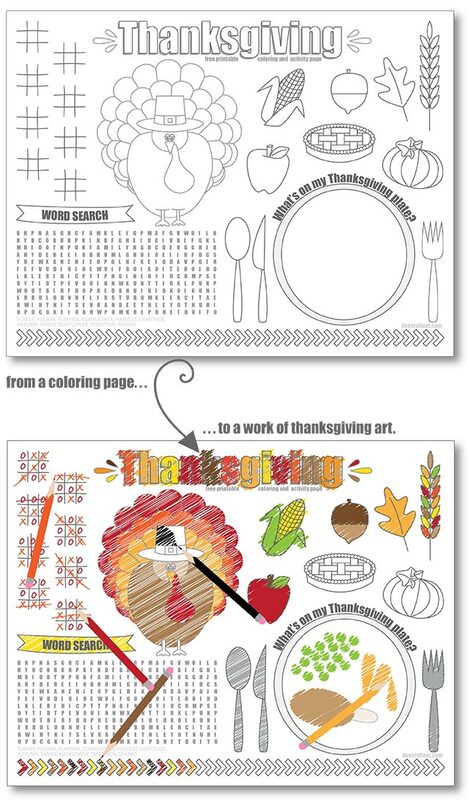 your kids can also color in the title “thanksgiving” and the little arrowhead designs in the upper left corner. gratitude :: there is a place for your kids to write down all the things they are thankful for this year. games :: there are a few tic-tac-toe boards…if they use pencils or erasable colored pencils (aff link), they can erase the tic-toe-toe games and play for as long as they want! there is also a word search with several fall/thanksgiving words for them to find. the picture below (with the pinecone turkey) is what it looks like with a salad plate on it, so you can get an idea of how big it is. i should mention, though, that this salad plate is a little larger than most, and it still doesn’t cover the whole circle, so you could definitely still use a dinner plate on this and be fine! by the way, this painted pinecone turkey is one of the decoration/place card holders we made and it is adorable! there are other ones we made, too…just search “pinecone turkeys” in the search bar on the top right of my sidebar and you’ll find all three variations! click here to download the 12″x18″ thanksgiving coloring & activity page placemat in .jpg format! what’s on my thanksgiving plate? : your kids can draw what they want/think they’ll have on their thanksgiving plate. turkey, gravy, mashed potatoes…i’ll have it all, please! 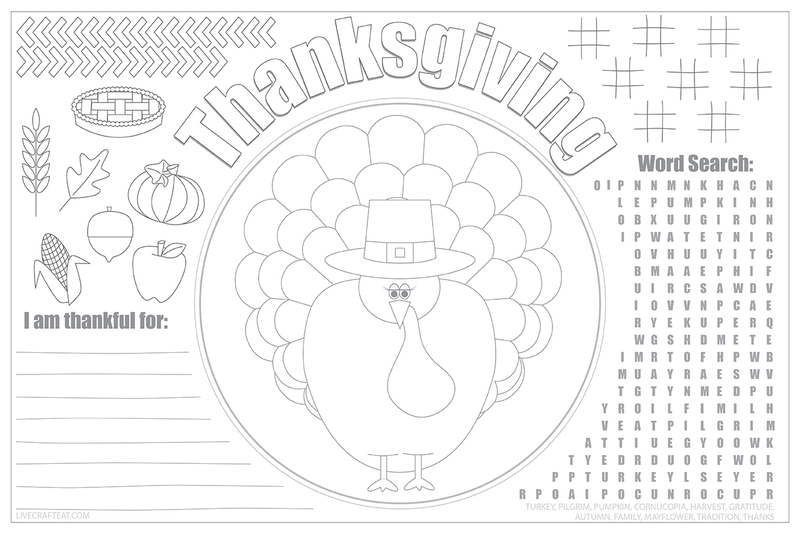 click here to download 8.5″x11″ thanksgiving coloring and activity page in pdf format! i’m so happy with how both of these sizes turned out and know that my kids (and yours too!) are going to love them, no matter which one you decide to use! if you like this post, please feel free to share the image below (or any image in this post!) on social media! thanks for your support!